Ukrainian-Australian pianist Alexey Koltakov has won a gold medal in the San Antonio International Piano Competition. You can visit Alexey's website here and listen to a bit of his music as well as read reviews and a bio. Alexey Koltakov of Ukraine and Australia won the $15,000 top prize to become the gold medalist in the Ninth San Antonio International Piano Competition. Robert Rios, vice president of the competition, announced the winners late Friday after the final round in Trinity University's Ruth Taylor Recital Hall. The judges chose not to award a silver medal and the accompanying $10,000 prize. There was a tie for the bronze medal — Grace Fong and Michael Mizrahi, both of the United States — with each receiving $5,000. From his website and bio: "Alexey Koltakov “…may have changed his citizenship from Ukrainian to Australian, but his musical outlook is still unmistakably eastern Slavic, as evidenced by the bold crescendos and resonant pedal-padded sonorities he produced in the first few seconds of his first work… hardly anyone could dispute his energy and clarity.” These comments in a review by Wayne Lee Gay of the Fort Worth Star-Telegram (Texas) encapsulate Mr. Koltakov’s approach to playing the music he loves and that is adored by his audiences around the world. Born in Lugansk, Ukraine, Alexey Koltakov became a student of Victor Makarov at age of 13. Three tours of the United States during his teenage years were highlighted with appearances in Boston, Chicago, Cincinnati, New York, Philadelphia, and Washington D.C. His piano virtuosity has also taken him to China and to his new home since the late 1990s, Australia, where performances have included a “Prom” concert as part of Sydney Festival ’99 and Tchaikovsky’s First Piano Concerto with the East-West Philharmonic. Alexey’s playing and accolades continue to elevate his prestige as an artist. Among his successes: he took first prize at the 1996 International Vladimir Krainev Competition in his native Ukraine, and, with wife Katerina Makarova, was awarded second prize at the December 2001 Eighth Murray Dranoff International Two Piano Competition in Miami, where the duo also received a special award for their performance of Lowell Liebermann’s contest piece, Three Lullabies. 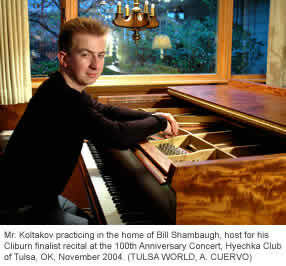 Significantly, Mr. Koltakov was named a finalist in the Eleventh Van Cliburn International Piano competition in June of 2001, for which he was awarded three years of concert engagements and career management services through the renowned Van Cliburn Foundation. He was featured in PBS’s Peabody award-winning documentary Playing on the Edge which chronicled the 2001 competition. His Final Round Cliburn Competition performances were showcased in the PBS series concerto, as well as his performance with the Fort Worth Symphony Orchestra and Maestro James Conlon. Scott Cantrell of The Dallas Morning News noted that “Mr. Koltakov came closer to the music’s heart than most concert pianists these days” in his review of one Rachmaninoff recital. He is an incredible pianist, it reminded me of Richard Clayderman in his beginnings, really good talent. He is the heir of Chick Corea! I saw his performance a few days ago in a St.Francisco theater, simply incredible! Will Rice meet with North Korean representative?